Flash memory firm SanDisk has made a substantial investment in flash-based cloud storage gateway startup, Panzura. Let's introduce Panzura. Among other items, it produces a Quicksilver Cloud Storage Controller providing access to files in the cloud using Panzura FS, a global file system, with a single namespace, global deduplication, and read-only access to locked files. The theoretical upper limit to its object file system is 128 zettabytes (100 million terabytes). All Quicksilver controllers in a file system present the same file system view to users. A Cloud Storage Controller has tiered storage system DRAM, SSDs, RAIDed disk drives, and a cache. Files can be pinned so that they are held locally for fast access. The company says it provides cloud capacity with LAN-speed access. Controllers at new locations become new directories in the filesystem and offer immediate access to existing users. Snapshots are used for protection, and there can be up to 10,000 per controller. 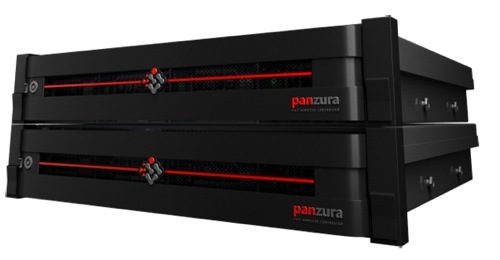 Although Panzura produces a hardware and software controller, it also produces a software-only version running as a virtual machine. Quicksilver controllers can be clustered to add more capacity and throughput. Panzura is planning to add support for the Joyent Manta cloud object storage service platform. CEO Randy Chou and CTO John Taylor cofounded Panzura in July 2008. The company recently gained $25 million in D-round funding, raising cash from Meritech Capital Partners, which led the round, and existing investors Chevron Technology Ventures, Khosla Ventures, Matrix Partners, and Opus Capital. Total Panzura funding to date stands at $58 million. It says it's fast-growing, having grown its customer base by 700 per cent in 2012. And it has already exceeded 2012 bookings thus far in 2013. A $15 million C-round of funding in June 2012 helped pay for EMEA expansion, which enabled Panzura to gain customers in the UK, Switzerland, and the Nordics. There was a $12 million B-round in December 2010 and a $6 million A-round in September 2008. That's the background; now on to SanDisk's involvement, via its venture arm, SanDisk Ventures, which previously invested in all-flash array vendor Whiptail. It was actually a participant in Panzura's D-round, although not announced as such by Panzura. Sumit Sadana, SanDisk EVP and chief strategy officer, provided a motherhood and apple pie canned quote: "Panzura's innovative global NAS cloud infrastructure solution offers numerous benefits compared to traditional on-premise NAS offerings. Panzura is another excellent example of the important role flash memory is playing in the transformation of the enterprise." Randy Chou provided the Panzura perspective: "SanDisk's technical expertise and market presence will be invaluable as we continue our focus on growing our business in the cloud storage controller market." So what does this SanDisk involvement mean? The company states: "By collaborating with SanDisk, companies like Panzura gain access to SanDisk's broad product portfolio and world-class technical expertise, as well as expanded customer and channel opportunities." We're talking SSDs, Toshiba/SanDisk NAND chips, flash controller hardware and software, and FlashSoft caching-software technology. SanDisk wants to become a supplier of flash technology products to enterprise. Investments in Whiptail and Panzura give it the opportunity to learn what suppliers of all-flash arrays and flash/disk-based cloud storage gateways need, and also, potentially, a channel for sales of its flash products.